Facing National Outcry, Ferguson Police Drop Military-Grade Gear as Protests Continue over Shooting | Democracy Now! Democratic committee member of Ferguson Township. Protests are continuing in Ferguson, Missouri, over the death of Michael Brown, an unarmed African-American teenager who was shot by police on Saturday. But the mood in Ferguson has changed drastically over the past 24 hours. On Wednesday night, the city looked like a war zone as police fired tear gas, stun grenades and smoke bombs. Police arrested at least 10 people, including a St. Louis alderman and two journalists. But last night the mood was less tense after Missouri Gov. Jay Nixon put an African-American Highway Patrol captain, Ron Johnson, in charge of security in the town of Ferguson. Johnson marched with protesters and ordered the riot gear put away. We go to St. Louis to speak with the Rev. Renita Lamkin, who was hit with a rubber bullet by police on Wednesday while attending the protest, and Patricia Bynes, Democratic committee member of Ferguson Township. JUAN GONZÁLEZ: Protests are continuing in Ferguson, Missouri, over the death of Michael Brown, an unarmed African-American teenager who was shot by police on Saturday. But the mood in the town has changed drastically over the past 24 hours. On Wednesday night, Ferguson looked like a war zone as police fired tear gas, stun grenades and smoke bombs. The police arrested at least 10 people, including a St. Louis alderman and two journalists. But last night the mood was less tense after Missouri’s governor, Jay Nixon, put an African-American Highway Patrol captain named Ron Johnson in charge of security in the town. Johnson marched with protesters and ordered the riot gear put away. CAPTAIN RON JOHNSON: I grew up here, and this is currently my community and my home. And therefore it means a lot to me personally that we break this cycle of violence, defuse the tension and build trust, showing the utmost respect for every interaction with every citizen. And when we talk about boots on the ground, my boots are going to be on the ground. And actually, I plan on tonight, myself, walking to the QuikTrip, that has been called ground zero, and meeting with the folks there myself tonight. AMY GOODMAN: The events in Ferguson over the past week have sparked a national debate over racial profiling and the militarization of local police forces. On Thursday, President Obama addressed the situation in Ferguson but made no mention of race in his remarks. PRESIDENT BARACK OBAMA: There is never an excuse for violence against police or for those who would use this tragedy as a cover for vandalism or looting. There’s also no excuse for police to use excessive force against peaceful protests or to throw protesters in jail for lawfully exercising their First Amendment rights. And here in the United States of America, police should not be bullying or arresting journalists who are just trying to do their jobs and report to the American people on what they see on the ground. AMY GOODMAN: In a statement, Attorney General Eric Holder said, quote, “I am deeply concerned that the deployment of military equipment and vehicles sends a conflicting message.” What Holder didn’t mention was the federal government’s role in supplying local police forces with military-grade equipment. The New York Times reports Department of Homeland Security grant money paid for the $360,000 BearCat armored truck on patrol in Ferguson. Most of the body armor worn by officers responding to the Ferguson protests was also paid for with federal money. Residents of Ferguson are still demanding answers about why police shot Michael Brown, the unarmed teenager, and why the police department has taken so long to release the name of the officer involved. FERGUSON RESIDENT: We don’t want no private meetings going on. We’re not here for no policy. But we’re here to talk about what that happened to us as black people around the world. We want the world to know we’re being dogged. We’re asking for 100,000 people to come into the city of St. Louis to help us with the racism that they’re doing. They are dogging us as black people. They are shooting us down in the street like dogs, animals! They’re shooting our babies! They are killing them for no reason other than we’re black. Our problem is not in Afghanistan. Make sure yourself [inaudible]. They never talk about us. Our problem is not in Afghanistan. Our problem is not in Israel. Our problem ain’t with Islamic Jihad. Our problem is in America with these racist white folk running America. JUAN GONZÁLEZ: For more, we’re joined by two guests in St. Louis. Patricia Bynes is Democratic committeewoman of Ferguson Township. 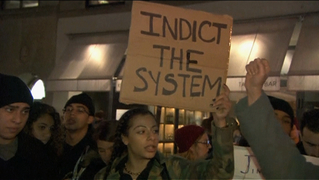 She joined us Thursday to describe the police state she saw on the streets there. She tweeted Thursday that “This seems like a completely different place.” We’re also joined by the Reverend Renita Lamkin, pastor of St. John African Methodist Episcopal Church in St. Louis, Missouri. She was hit with a rubber bullet by police on Wednesday during protests in Ferguson. And joining us via Democracy Now! video stream is Radley Balko, author of the book, Rise of the Warrior Cop: The Militarization of America’s Police Forces. He’s also a blogger for The Washington Post. Welcome, all of you, to Democracy Now! I’d like to begin first with Patricia Bynes. What has changed since the last 24 hours in Ferguson? PATRICIA BYNES: Well, good morning, everybody. The change has been incredible. It feels like there’s been a military occupation lifted off of the area. It’s just been a complete change in spirit. The same people who were out protesting and who were out—have been out in the streets were out—it was like a party last night. Everyone was relaxed, smiling, happy, for the most part. You know, there weren’t too many issues. It was just amazing. And it happened in the same place where we were running from tear gas and trying to dodge rubber bullets and smoke bombs the exact night before. AMY GOODMAN: Reverend Renita [Lamkin], you were hit by a rubber bullet. When did that happen? And can you describe the situation? REV. RENITA LAMKIN: It was Wednesday night. And the police told us to disperse, or, you know, whatever would happen. And we didn’t disperse, and so they sent out the tear gas. And people ran, and then we gathered a little bit further back. And they let us hang out there for a while, and then they told us to disperse again, and we didn’t disperse. And they said disperse, or this will happen. And then they tear-gassed. And some young guys didn’t want to—didn’t want to go still. So, I was trying to get them to keep going. And then the rubber bullets came after the tear gas. JUAN GONZÁLEZ: And, Reverend Brown, why did you feel that you had to be out there with the crowd that night? And what was your reaction to this extreme crackdown by police, basically in military gear? AMY GOODMAN: You know, Reverend, when we hear that rubber bullets, among other things, are used, some people might think, well, they’re rubber bullets, they’re not live. Explain exactly the impact this rubber bullet had on you. REV. RENITA LAMKIN: Well, left a pretty good red mark and a pretty nasty bruise, and it stings. It’s not comfortable. I don’t recommend it. AMY GOODMAN: This happened to—they hit you in the stomach? How close were the police to you? REV. RENITA LAMKIN: I don’t know. They weren’t close enough where I could actually see them through the fog. I don’t know how close they were. I mean, it was pretty chaotic. JUAN GONZÁLEZ: Patricia Bynes, I’d like to ask you—the press conferences that were held yesterday, first by the governor, who clearly was rebuking the local police, and certainly, by sending in state troopers to take over the situation, was condemning the actions that had occurred previously, and then, of course, President Obama himself, while measured in his tones, made it clear that there were violations that appeared to have occurred of people’s right to protest and of the right of journalists to cover events—the impact that that had on you as you heard of those statements by the governor and by the president? PATRICIA BYNES: Well, I think, to me, it felt like our concerns were being heard. I had several statewide elected officials call me personally and was asking, “Patricia, what’s going on? We know that you’re down on the ground.” And I was able to tell them exactly what was going on and how I did not think that things were going to get better if things continued at this route. So, it’s good to know that it was being heard. The governor needed to do something. There needed to be a serious intervention here, because the tactics used, just it was just too much. And I am very glad that President Obama did come out and say something, because I think the images that the country saw, or even the world saw, about what was going on here in the St. Louis area were disturbing and could not be ignored anymore. This was just a physical manifestation of the hostility between the community at large and, it seems like, the policing. It’s not just a Ferguson incident, but just the issue of police harassment and police brutality and police tactics used on this community. That’s what you saw the physical manifestation of. AMY GOODMAN: Thursday, Congressman John Lewis, the well-known civil rights leader, appeared on MSNBC and compared the police response in Ferguson to what he experienced during the civil rights movement when he and others were attacked by police during peaceful protests. REP. JOHN LEWIS: It takes me back to the ’40s, the ’50s, the ’60s. And to have a city that are majority African-American and only three African American on the police force, or to have a local police officer referring to the protesters as “animals,” or to have people dressed in military garment and pointing rifles directly at the protesters, that is only going to incite people. So my own feeling is, right now, is that President Obama should use the authority of his office to declare martial law, federalize the Missouri National Guard to protect people as they protest. And people should come together—reasonable elected officials, community leaders—and address what is happening there. If we fail to act, the fires of frustration and discontent will continue to burn, not only in Missouri, but all across America. AMY GOODMAN: That was Congressmember John Lewis.